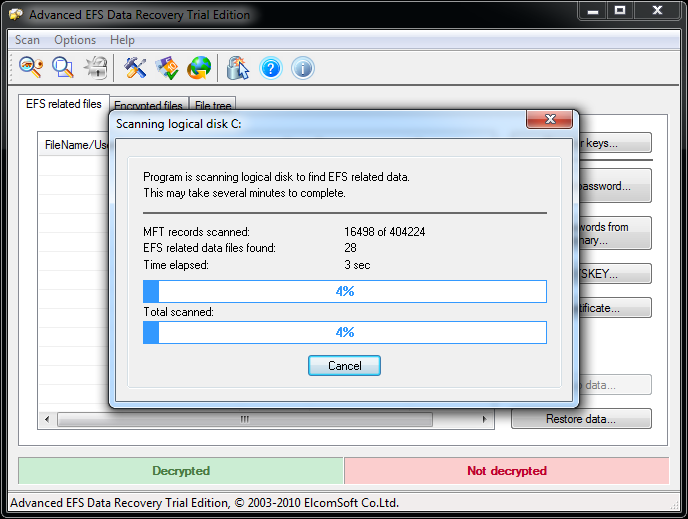 Advanced EFS Data Recovery | Elcomsoft Co.Ltd. Cassage du chiffrement NTFS et des fichiers protégés par le système Encrypting File System (EFS) dans Windows. Supporte: toutes les versions utilisateur et serveur de Windows, de Windows 2000 à Windows 10, NTFS, Encrypting File System (EFS), fonctionnant avec des utilisateurs à distance. Microsoft Encrypting File System (EFS) is an integral part of Microsoft Windows operating systems enabling users to protect their files against unauthorized access even from those who gain physical access to the hard disk or the computer that contains the encrypted files. 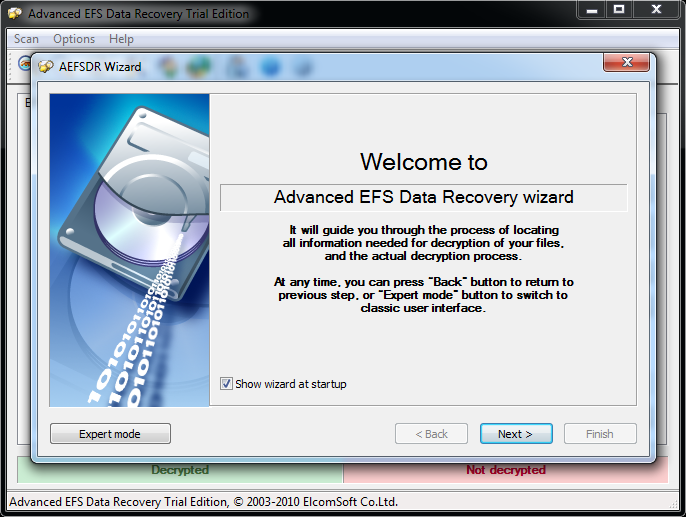 Advanced EFS Data Recovery decrypts the protected files, and works in all versions of Windows 2000, XP, 2003, Vista, Windows 7, 8, 8.1, Windows 10, Windows Server 2008, 2012, 2016. The recovery is still possible even when the system damaged, is not bootable, or when some encryption keys have been tampered with. Advanced EFS Data Recovery recovers EFS-encrypted data that becomes inaccessible because of system administration errors such as removing users and user profiles, misconfiguring data recovery authorities, transferring users between domains, or moving hard disks to a different PC. Advanced EFS Data Recovery is a powerful data recovery tool that helps recovering the encrypted files under various circumstances. 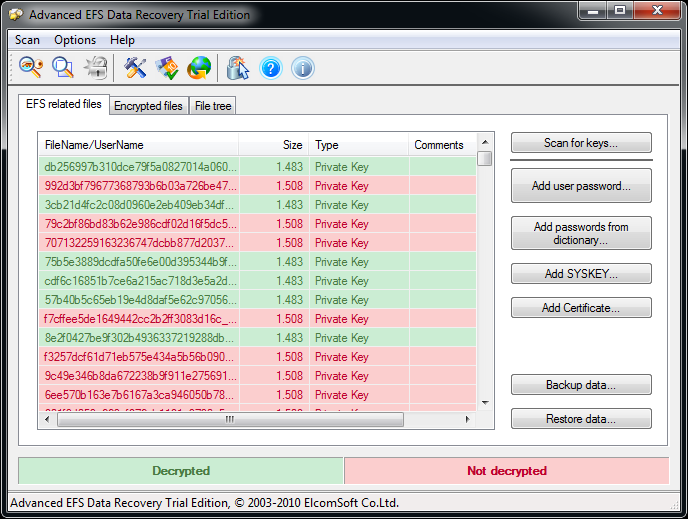 Advanced EFS Data Recovery decrypts files protected with EFS quickly and efficiently. Scanning the hard disk directly sector by sector, Advanced EFS Data Recovery locates the encrypted files as well as the available encryption keys, and decrypts the protected files. 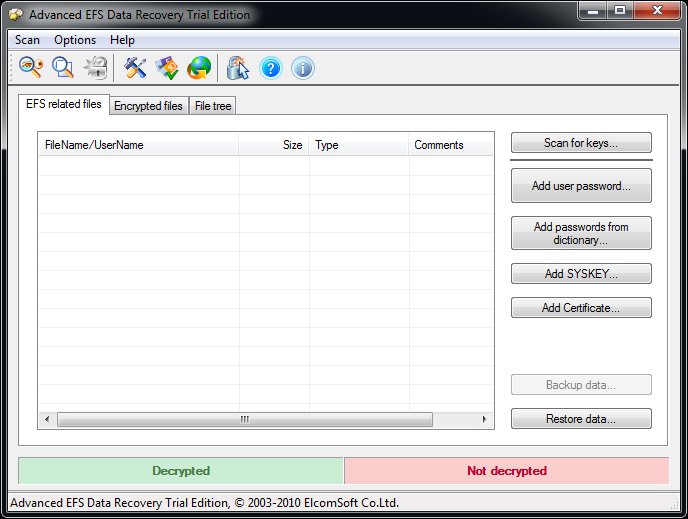 The direct access to the file system allows Advanced EFS Data Recovery to recover encrypted files in the most difficult cases even if the disk with data is only available without a valid user account to login into system, or when some encryption keys have been tampered with.